The Philippine Ruby User Group will have guestspeaker Biddy Magsipoc discuss on Rails integration with Paypal IPN with cucumber tests. Wondering what the Cloud can do for you? 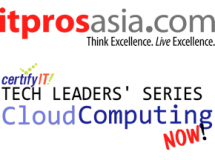 itprosasia.com presents "Cloud Computing Now! ", a whole-day affair that seeks to re-introduce tech and it professionals to the benefits of the Cloud. For its Certify IT! Tech Leaders' Series, the event will bring in key IT professionals who will share their experiences and tools on the Cloud.